Perhaps you’ve heard of it? Perhaps you are skeptical about a workout that’s only 7 minutes long? Don’t get me wrong, I was skeptical as well, and still am! I have, however, found that it is a really great addition to any cardio you’re already doing. So often I finish a 2 or 3 mile run and wish I had something to do besides my 30 minute Jillian Michaels workouts (because those are killers).For the past few weeks I have been adding this 7-minute challenge to the end of a run or bike for the extra push. All you need are a chair, a wall, your body weight, and a little motivation! Laugh if you want, but I guarantee you you’ll be breathing a little heavier by the time you finish. You can download it on your phone as an app for free of your can visit the website HERE. It’s essentially a high-intensity interval training (HIIT) workout (just shorter than usual). You do each challenge for 30 seconds and move onto the next after a 10 second break. 7 minutes later you will have completed 12 different exercises and I promise you, you’ll feel better because of it. The reporting around this little 7-minute miracle is pretty bogus in my opinion…it’s NOT a quick fix…BUT it is a great addition to any workout. As a runner, and not a weight lifter, I often forget about strength training. 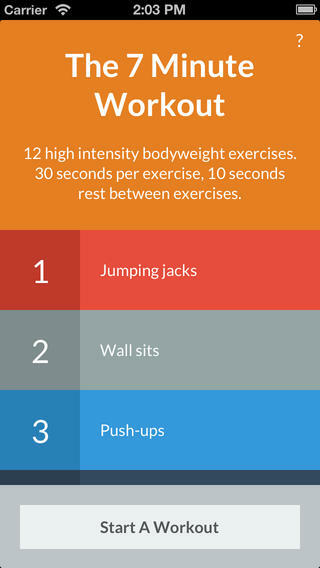 This little app helps me add in 7 minutes of strength training using my own body weight after each run. That’s why I like it! The application itself is free and user-friendly with tutorial videos, a count down timer, and a simple interface. Tip #1: Explore the workouts ahead of time so that you have a better understanding of the proper form used. Proper form = a better and more effective workout. Tip #2: Give it your all! The key to this is HIGH intensity at MAXIMUM capacity. You want to be sweating at the end of it…not just going through the motions. It’s only 7 minutes long, so make those 7 minutes count. Your arms , core, and legs should be shaking by the time you get to the side planks. Tip #3: Don’t fall into the myth that a 7 minute workout is enough…because it’s not (sorry!). It’s great to get your heart pumping, and a great addition, but this is not a “quick fix” for weight loss and you will not lose weight by doing a 7 minute workout once a day. Quick fix solutions are toxic ladies and gents! Tip #4: Don’t have time for the gym but want to use the app to workout? Do 3 or 4 of the 7-minute workouts in a row — that’s far more effective than a 7 minute workout alone. Tip #5: Want something longer than 7-minutes? Checkout the Seconds Pro – Interval Timer app. You customize your own circuit with personalized exercise and break times. I apologize to all the lovely readers out there who thought they had found the miracle quick fix. 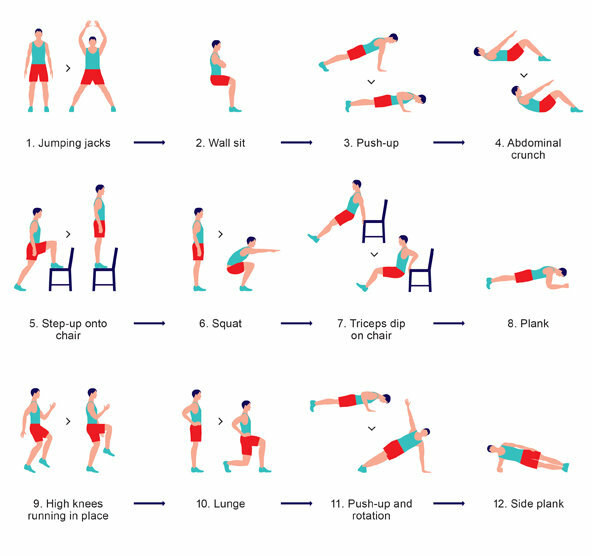 The 7-minute workout is a great addition to any cardio work you do and is perfect for getting a working out in the privacy of your own home. However, I’ve been doing it for several weeks now and I know that 7-minutes alone are not going to make me an elite athlete and it’s far from a miracle worker. But if free and easy to use programs like get people more active – then I am all for it! It could be a great starting point for beginners as well! My lovely friend, Broke Millennial, feature the 7-minute workout on her latest Frugal Find Friday post. Head on over and check her out! This got me thinking…what other apps are out there that are free and/or cheap but worth it? Here are a few that I use. There are also some really cool charity apps which I have not downloaded yet..but should! For example, Charity Miles tracks your workouts and gives 0.10 for every mile bikes and 0.25 for every mile you run/walk. You can donate the money to Stand Up To Cancer, Feeding America, The Wounded Warriors Project, and many other great organization. What are your thoughts? Have you used it? Do you supplement your running with additional strength training? Let us know in the comment section below! Comment below and share your thoughts or ideas on NEW workouts apps! I would love to hear them! I agree with you, the “quick fixes” are a pet peeve of mine because a lot of people new to exercising believe it and it’s extremely misleading to them, but these are great exercises to add after some cardio! I like that it doesn’t require equipment too. I’ve heard some positive feedback about the Nike Training Club app, but haven’t tried it out myself yet. I usually just do some free weight exercises along with body weight exercises to supplement my running, but it’s always nice to find something new to mix it up with! 100% with you! Quick fixes and dieting pills are huge pet peeves of mine. We have to put in the time and hard work to get results (and we will! ).